Overview: Our Free Double Double Bonus Video Poker game obeys the standard video poker rules and is a single hand type video poker machine. It is played with a standard 52 card deck and the cards are shuffled before each hand. Wild Cards: There are no wild cards in Double Double Bonus Poker video poker. Winning Hands: Double Double Bonus Poker can be won by getting any one of 13 winning hands, these are; Royal Flush, Four Aces with any Two, Three or Four, Four Two's, Three's or Four's with any Ace, Two, Three or Four, Four of a kind Aces, Four Two's, Three's or Four's, Four of a Kind (Five's through to King's), Straight Flush, Full House, Flush, Straight, Three of a Kind, Two Pairs or Jacks or Better. 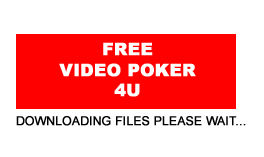 Similar Free Video Poker Games: If you like our Double Double Bonus Poker Video Poker game you might also enjoy playing our Free Joker Poker which has the joker as a wild symbol to give you more chances of winning. Or you could try playing more than one hand a time if so then why not try our Free Multi Hand Aces and Faces Video Poker, which allows you to choose to play between 2 and 4 hands at a time.